Edited by Wiedzmin, 10 June 2017 - 1312 PM. What is the performance of 115mm AP rounds? Only I was reading an account of a hit in this area from a 115mm round on an Israeli Centurion which similarly penetrated, just wondering if its a similar level of performance. If 3BM4 - probably worse against zeroed target and comparable/better against highly angled. Plus bigger drag so worse long range performance. But after armour should be MUCH greater due to some moments of early steel APFSDS rounds. 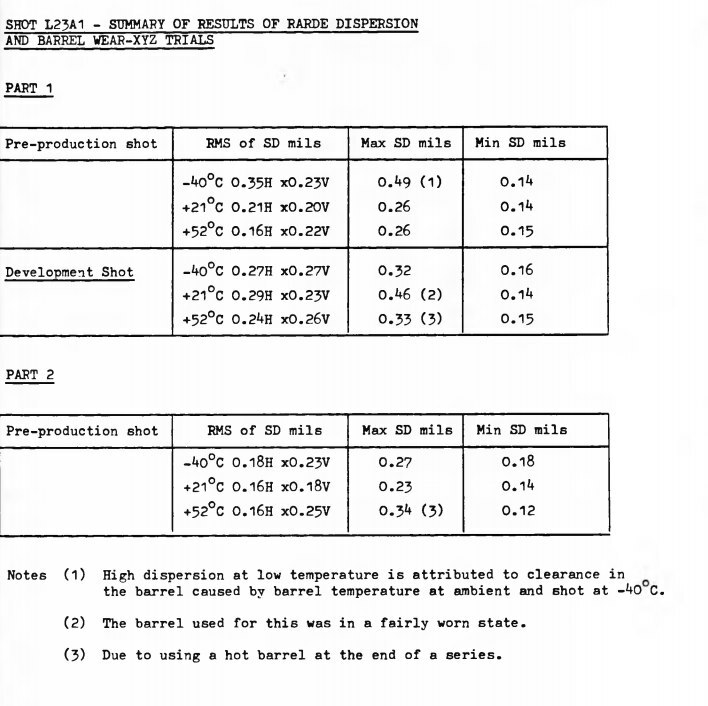 Yeah, David Isby claimed in his 'Weapons and Tactics of the Soviet Army' that the Israelis considered the 115mm gun, at least at short to medium range, to be a better gun than the 105mm. An fact i gather they DID penetrate Chieftains in the Iran/Iraq war, despite the Chieftain having a range advantage over it. Poor operation probably didnt help of course. Looks like WO 194/466. It is a nice report that is not only gives a hint about hit results but also about logistic asspect of recovery of damaged vehicle. Plus nice examples of FVRDE pictorial code in right upper corner. Found something from Dec 1979 on XL23E1, labelled as "512 mm" (body? penetrator itself? ), W-Ni-Cu, for gun with pressure of 26 tsi. There were also discussed few more rounds: W-Ni-Cu 512 mm (33 tsi, for MBT-80 gun); W-Ni-Fe and DU of 512 mm (26 and 33 tsi) and two W-Ni-Fe and DU of 650 mm (26 and 33 tsi). XL23 programme (there is also known another designation, XL22, the most probably earlier) seems an offshot of trilateral gun trials. US shared some part of their APFSDS technology with UK; penetrator that "won" in 1976 shooting from L11 gun was US-orgin. W-Ni-Cu was firstly prefered because older APDS could be utilised. Edited by Przezdzieblo, 14 June 2017 - 1446 PM. Correct me if Im wrong (I probably am) but wasnt the trilateral gun trials with a British 110mm gun? I cant recall if they built it or not, but ive a feeling they built at least one working prototype. They had pretty much pulled the plug on it by 1976 or so, if DEFE 48/240 'A study of Future Main Battle Tank Options to replace Chieftain' is any guide. In 1975, during the first round of trilateral trilas, both US and UK tested new APFSDS projectiles. The first one was XM774 model 28, the second - 110 mm projo with US core. Both were only considered as growth potential and as such did not count into official results, leaving FRG as a winner, but also convincing US that the next round of trials could be useful. 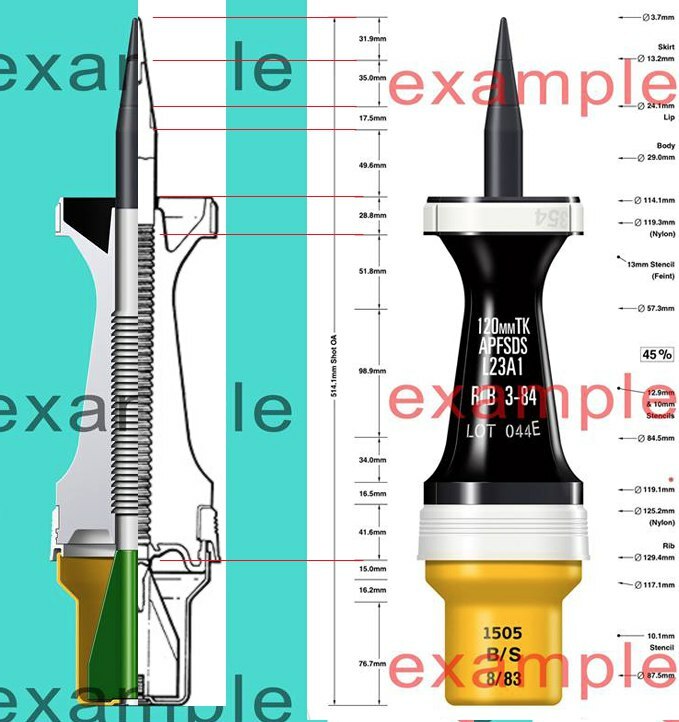 In 1976 UK tried new APFSDS and L11 combo which has shown the best performance in terms of armour penetration. Hence US gave UK more time to develop the new 120 mm gun - EXP-M13A. In late 1977 there were the last round of trilas in USA. UK and FRG rounds gave almost the same performance, UK HEAT failed. FRG won on system maturity ground (officially). btw what was the penetration(at 0, at 60 for 2km?) for XM774 ? serial round doesn't look to have good l/d 1/14 - 1/16 or so ? Edited by Wiedzmin, 15 June 2017 - 0558 AM. This is interesting stuff. Did you ever find any dispersion data for L23? That looks to be broadly 450 RHA, which is about what I thought it is. This is highly significant if true, because it means what I supposed L26 and L27 are might be true also. Hmm, good news. Or at least, better than Ive been assured it was. Thanks for that. Im not remotely technically minded to comment on how good this is, how does it compare to american 105mm rounds of the same period? Edited by Stuart Galbraith, 27 June 2017 - 0700 AM. Edited by Wiedzmin, 27 June 2017 - 0731 AM. What document is this from? A 490 mm penetration path would require a 130 mm steel plate to be sloped at 75° (at 74° the line of sight is only 471)! So did they actually use a 130 mm plate sloped at 75° or am I misunderstanding the table? Because according to Lanz-Odermatt, the penetration values of APFSDS ammunition against 75° slope are about ~35% larger than against 0° slope. yes it's very strange test, and seem to be 75°, + don't know right term in english heading angle(?) +- 13-16°(left and right), but it used to imitate T-72 glacis, so it must be in 68-70° range.
! So did they actually use a 130 mm plate sloped at 75° or am I misunderstanding the table? Edited by Wiedzmin, 16 September 2017 - 1514 PM. Missed this the first time but the designation should be the EXP19-M13A. The ordnance development work was to enable the gun system to match the mounting and C-of-G configuration / limitations required to suit the XM1. 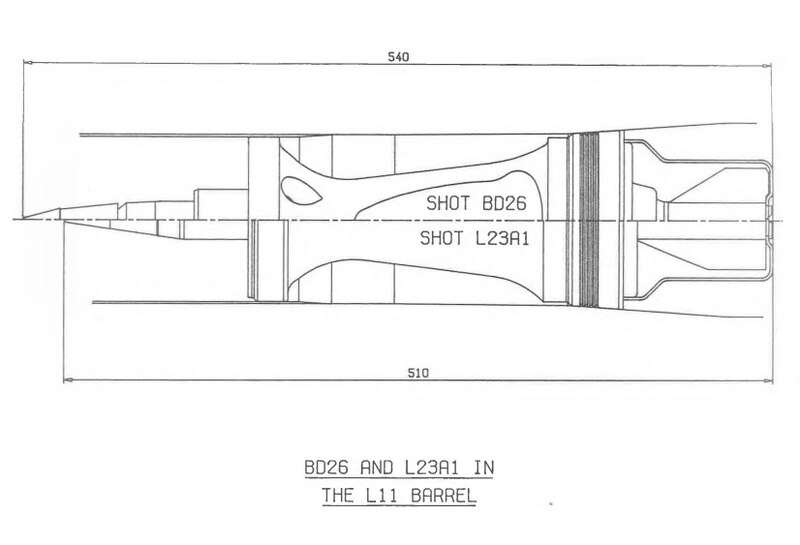 Found out what that penetration table for L23A1 is supposed to mean. The numbers have nothing to do with a 130mm plate. The key is that the penetration numbers are all for a semi-infinite plate at a 68 degree obliquity and it's just the LOS penetration depth. The T-72M hull has 400mm RHA equivalent of effective armour in relative LOS thickness, so the requirement was to ensure that L23A1 can defeat the T-72M hull at 3.5 km. I calculated the penetration for all 5 ranges at +21°C using the velocities given in the table and dimensions given by Wiedzmin and they all came out exactly like the results in the firing table. Average error was just 0.0027%. It was only a matter of rounding up or rounding down. 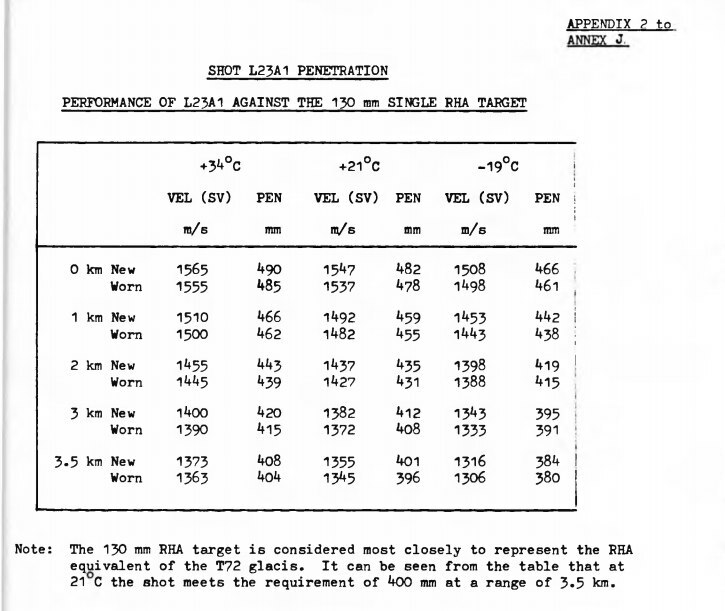 I had assumed the "130mm single RHA target" simply refers to the NATO "single medium": 130mm RHA sloped at 60 degrees (not 68)... and then they put a few RHA blocks behind that to calculate semi-infinite penetration. Can you post more of this doc Wiedzmin? Maybe there's some additional text that explains the oddity. Edited by Olds, 13 April 2018 - 1902 PM. Edited by Wiedzmin, 08 May 2018 - 1613 PM. This has been confirmed by new information?